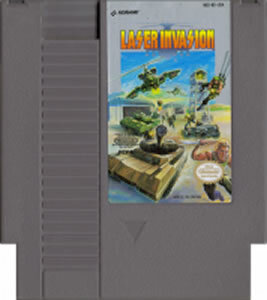 Laser Invasion was released for the NES in 1991 and was developed and published by Konami. 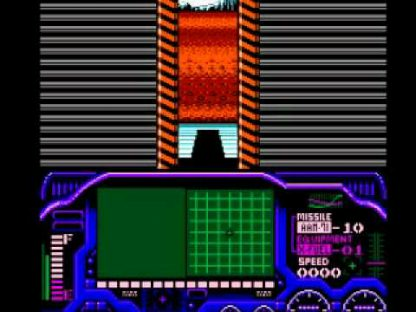 The player will control a military pilot that flies an attack helicopter to complete his missions. 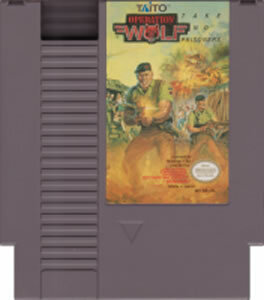 The game will support a normal NES controller along with compatibility with the Zapper gun. 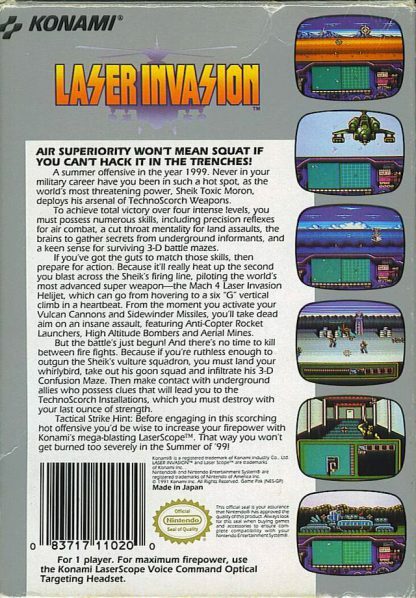 The Laserscope that Konami created is also supported, which is a headset controller that is voice activated and is compatible with every Zapper gun games for the NES. The story is about a nation that is hostile with a secret plan to fire a new weapon against their enemies. 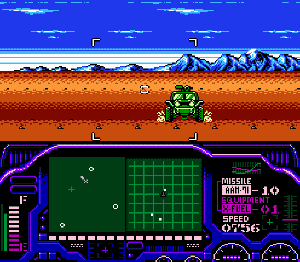 The player’s pilot is a part of special armed forces, and the objective is trying to stop the enemy from firing their new weapon. The main objective for the player is rescuing an agent with the codename Spider, who was captured by the enemy and located in an enemy base. The game has four missions each with three playing styles. The first mission is going to the area of the enemy with the AH-64 Apache. Before the start of every mission, the player receives a briefing from the officer in command. The officer explains the missions objective. 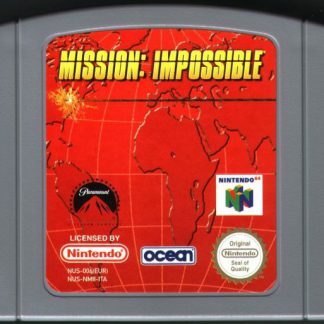 In every mission, except for mission 3 since it all takes place in air, the player will need to land the helicopter into an enemy heliport and then invade the enemies’ basses to complete a specific objective. When completing the mission, the player will need to escape the base. The controls, sounds, and amount of lives can be adjusted in the options before beginning the game. 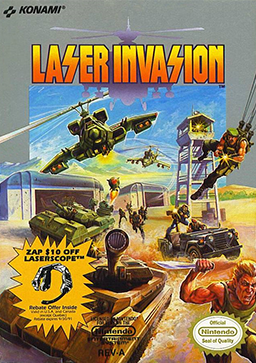 The shooting parts of the game can be played using a Zapper or LaserScope. When all lives are lost, the player has five continues to use. Extra lives can be gained with certain amounts of points. The first style of play is the helicopter mode. 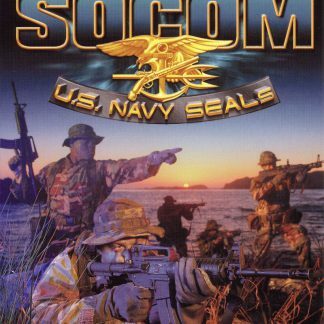 Each mission starts with the player piloting his helicopter before they land on an enemy heliport and invade their base on foot. 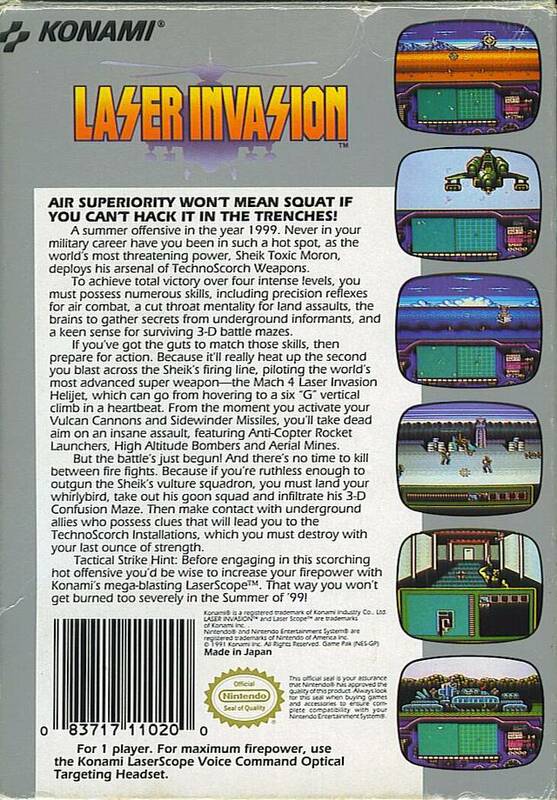 Before the start of the mission, the player is asked to choose the type of missiles they want equipped to their helicopter. The choices the player has are 40 small sized missiles, 20 medium sized missiles, of 10 large size missiles. This gives the player a choice of more but weaker missiles, a mediocre amount of missiles with medium power, or a small amount of missiles with great firepower. The player then chooses an optional equipment for their helicopter, with the choices being extra fuel, ground missiles, or chaff grenades. After choosing equipment, the player will then leave home base and head to the enemy airspace. The helicopter view is from the inside of the helicopter, first person. On the screen’s upper portion, it will show the current flight path of the player and the helicopter’s missile and vulcan cannon’s gun sight. The bottom screen portion shows the cockpit of the helicopter that displays the fuel, speed, damage condition, equipment, missiles, and two different radars. The first radar is Wide Area which shows the entire area, the current position of the player, positions of allied and enemy heliports, and the special targets. The second radar is Immediate Range, showing nearby enemy proximity. A warning lamp will light up to tell the player enemies are coming in from behind. 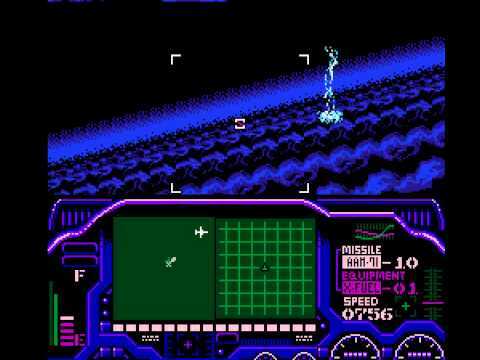 The player loses a life when they sustain too much damage, their fuel runs empty, or is struck by a missile. Chaff grenades can be used for invulnerability against missiles from the enemy for a period of time. The primary weapon for the helicopter is the vulcan cannon that has unlimited ammo. Missiles and the optional equipment can be switched by the player anytime during combat. The helicopter will fly towards the current flight path of the player at top speed by default. To be able to land on a heliport, the speed of the player’s helicopter will need to be reduced until it completely stops and is hovering above it. The helicopter will need to be aligned correctly by the player and the descend the helicopter carefully. Player’s will need to manage this with the wind conditions. If landing the helicopter fails, the player will need to do it again. Once landed safely, the helicopter will be repaired and refueled. The equipment will also be allowed to be changed. The second style of play is the gun shooting mode. After landing on an enemy heliport, the player’s character will get off the helicopter and progress into the enemy’s base. The gameplay of these segments are straightforward. The screen will automatically scroll right while different kinds of enemies start attacking the player. All the enemy soldiers will need to be attacked by shooting with the handgun provided like other Zapper gun shooting games. 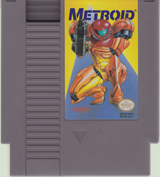 The screen’s bottom portion will show the player’s health and remaining ammo, which both can be refilled with power ups that are hidden in weapon crates. Specific oil drums can also be shot to kill all the enemies on screen. When the player reaches the base entrance, the shooting segment will end. The third style of play is the maze mode. After completing a shooting segment, the game will change the playing style once more. This time the game is in a first person exploring mode. 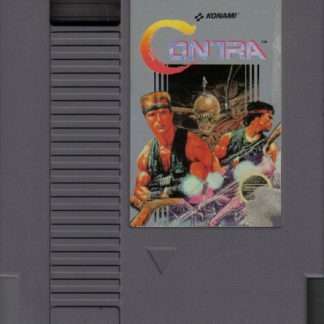 The player will need to control their character through the inner corridor of the enemy base and acquire vital items while trying to avoid traps. Extra ammo and health restoring pick ups are also spread throughout this mode. Spider, the player’s ally, will sometimes be encountered and he will offer you info on finishing the objective. When an enemy is encountered in this mode, it will switch to a shooting mode that is similar to the shooting segments earlier in the level until all the enemies are killed. When the player gets what they need to finish the mission, they will need to leave from where the mission began. The bottom screen portion will show the map, showing areas that have already been explored along with the current position of the player. The player’s health, ammo, and collected items will also be shown.